Fallout 76 recently saw its final beta session, and players managed to set off a nuke just before it ended. But to get to that point is a surprisingly tricky process that involves hunting for codes, finding a keycard and decrypting letters and numbers. A small group of players are claiming Fallout 76’s “world first” nuke launch, although Bethesda has yet to confirm it. 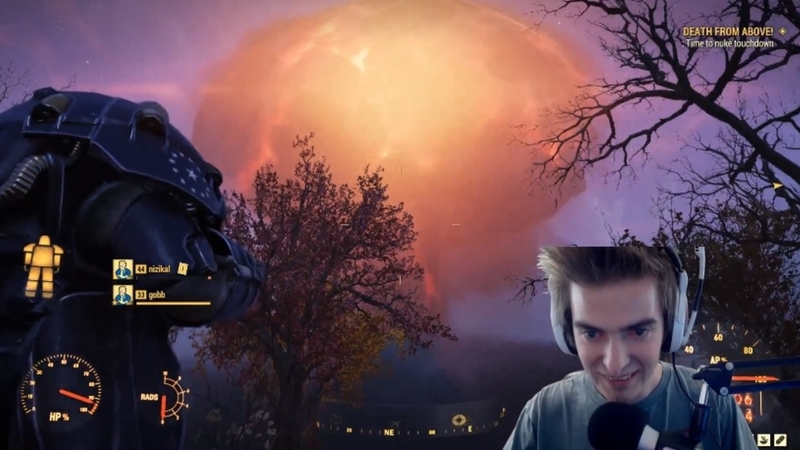 A streamer called FrenchTomahawk managed to call in a nuke late in the final beta session Thursday night after around four hours of sleuthing with the help of Twitch chat. The clip below shows the moment the bomb fell. THERE MAY BE SPOILERS AHEAD. So, how does it all work? First off, you have to join a faction (FrenchTomahawk and his gang joined the Enclave) and then find eight pieces of letter and number combinations out in the game. This is a difficult, long process. The codes drop from Scorched or Feral Ghoul officers, which isn’t much help. Thankfully, the Enclave does help. At their command center is a surveillance terminal, which points you at officers who carry the combinations. After you’ve got all eight combinations, you need to find a nuclear keycard. A terminal in the Enclave helps you track down the cargo bots that carry these keycards. But these flying cargo crates are defended by tricky to kill vertibots (automated vertibirds). Once you’ve downed a cargo bot, open it up for the keycard. With the correct launch code and the nuclear keycard to hand, you need to head over to your designated silo. This will be heavily guarded. Once inside, you need to input your keycard in one terminal and the correct launch code in another. This brings up a targeting computer, which you can use to aim the nuke. Clearly, this is all high-level, endgame stuff, and given the difficulty of some of the combat encounters, launching a nuke is designed for groups of players. As someone who’s played the beta, I can’t imagine doing this alone, that’s for sure. Players are still working out the benefits of chucking a nuke down on the game world, but based on what we’ve seen from the beta so far, a nuclear strike changes the blast zone considerably. There, you’ll find new, super tough monsters and rare materials. Oh, and extremely high radiation. Of note: the nuclear launch codes expire after a period of time, making this particular endgame hunt repeatable.